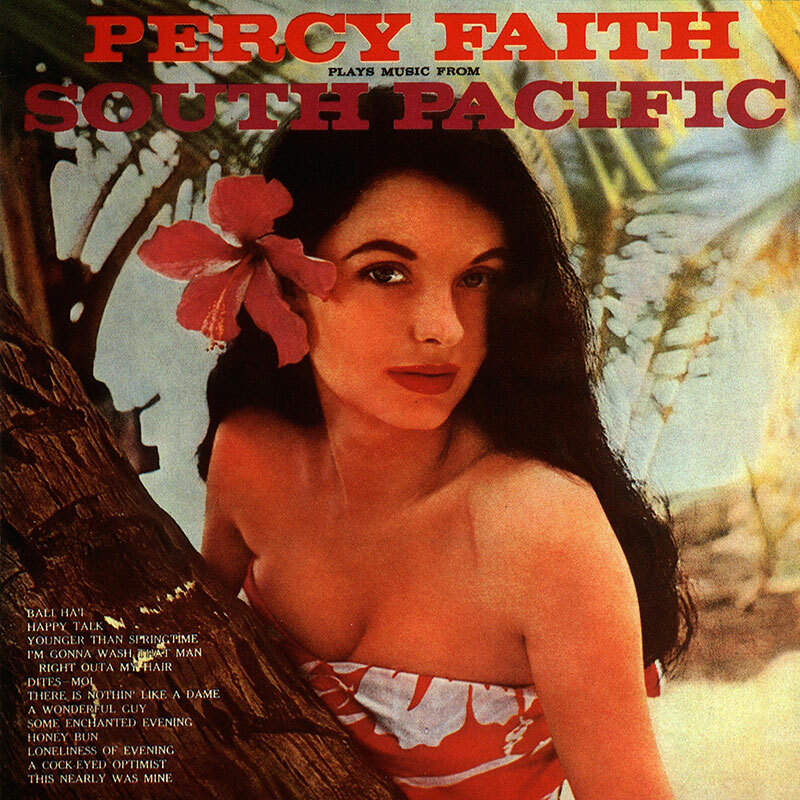 Percy Faith album: Music From "South Pacific"
Home » Discography » Original Albums » Music From "South Pacific"
It is not particularly likely that when Richard Rodgers and Oscar Hammerstein II set about putting “Tales of the South Pacific” to music they consciously went about creating a theatrical classic. A good show, yes. One that might take its place with “Oklahoma!” and “Carousel,” too. But what they produced was one of the most fabulously successful musicals ever written, one not even challenged until the appearance of “My Fair Lady.” The original production ran in New York City from April 7, 1949 for 1,925 performances and has since been twice revived. Only statisticians could compute the total number of performances by touring companies, foreign productions and those in summer theatres. In his biography of Richard Rodgers, David Ewen has pointed out that “by January 1957, the profit was just under five billion dollars.” And this did not count the screen version, in which the parts created by Mary Martin and Ezio Pinza are portrayed by Mitzi Gaynor and Rossano Brazzi. Moreover; the Lp recording of the score, with the original cast, was the first long-playing record to sell more than a million copies. There are a few diehards around who still have not succumbed to the charm and drama of “South Pacific;” there is always someone who legitimately does not like a show. But those millions who loved it when it was new have found that its charm does not diminish, but grows with the passing years. (This is also true of “Oklahoma!” and “Carousel.”) It is possible, though, that repeated hearings of the songs made them temporarily over-familiar, but in this superb recording, Percy Faith restores the original freshness. Who can hear Some Enchanted Evening without feeling again the warmth of the initial hearing? Or Younger Than Springtime, the joyous A Wonderful Guy or any of the other songs of that miraculous score? In Mr. Faith’s new arrangements, they take on all their old, familiar glow, and prove that it does not require a decade for a song to become a standard. “South Pacific,” like so many other classic productions, was almost perfect from its first try-out performance. All that remained to be done, really, was to cut here and there so that the running time would fit within reasonable standards. Since there were no dances, as such, in the action, only dialogue and music could be removed, and so tightly was the show constructed that some of the songs had to go. One of these was a melody sung by the young naval lieutenant, called My Girl Back Home. Another, and severer loss, was the beautiful Loneliness of Evening, hitherto recorded only by Mary Martin on a now rare 78rpm record, and by Andre Kostelanetz in his two-record album of music by Richard Rodgers. It has been restored in the film version, and Percy Faith includes it in this recording in a singularly affecting arrangement. This collection, like Percy Faith’s other souvenirs of fine Broadway musicals, presents the music of “South Pacific” not in the order of appearance, but in the form of a suite. Contrasts in tempos and moods that are effective on the stage are not necessarily the best for records, particularly without their lyrics, and so Mr. Faith has re-arranged the sequence to form an orchestral panorama of the score, moving from one number to another with that remarkable combination of ebullience and tragedy, romance and comedy, that is so uniquely a part of the production. This is a record to enjoy again and again, a splendid addition to the show-music shelf.